An introduction to the basic styles and design of All-Clad cookware. An All-Clad comparison guide is also available for additional detailed information on the differences between All-Clad styles. Your personal preference determines the final exterior finish. All-Clad is available in a variety of exterior metals and finishes. Individual choices can be based on kitchen style, frequency of use, dishwasher safe requirements, or cooking methods. All-Clad d3 Tri-Ply Stainless: Hand-polished 18/10 stainless steel is sure to minimize your cleaning time, because it is dishwasher safe and doesn't react with foods. This style has largest variety of pans of any All-Clad line and is the most popular All-Clad cookware. It is made in the USA. 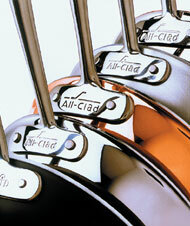 All-Clad also makes a variety of matching stainless steel accessories and utensils. All-Clad d5 Brushed Stainless: Features a brushed stainless steel exterior which looks nice and keeps its stylish look over time. Features 3 layers of metal that extend from the bottom to the edges of the pan. All-Clad LTD: I reinvention of the classic line, the LTD collection features a durable, hard-anodized exterior with a stainless steel cooking surface. Sandwiched inside is a conductive aluminum core found that helps the surface conduct heat with amazing cooking performance. All-Clad Copper Core: The cookware in the All-Clad Copper Core collection has a hand-polished 18/10 stainless steel exterior, with a small recessed grove at the base, revealing the inner copper core. The 5 ply construction of stainless steel exterior aluminum, a pure copper core, aluminum, and stainless steel cooking surface has all the benefits of easy cleaning. Copper Core is another made in the USA line from All-Clad. All-Clad HA1: All-Clad HA1 features a "commercial strong" exterior with a nonstick surface that is easy to clean and dishwasher safe. New for 2016, HA1 serves as a modern style successor to All-Clad LTD2. The interior of every pan is clad with a surface of top quality 18/10 stainless steel, whose primary benefit over other metals is its non-reactive nature. All you can taste is the food. A nonstick finish is coated on top of the 18/10 stainless steel in several styles. Aluminum Core: All-Clad has traditionally focused its product line on one core metal, aluminum. Second only to copper in heat conduction, aluminum has long been most popular with professional chefs. The All-Clad Stainless, All-Clad d5 Brushed Stainless, All-Clad MC2, and All-Clad Copper Cookware all have an aluminum core. Copper Core: Instead of aluminum, All-Clad Copper Core features a copper core layer in between the stainless steel. Copper is the best conductor of heat, allowing very quick and even heat distribution. The All-Clad Copper Core line is the only style with a copper core. Pure 18/10 stainless steel is used for every All-Clad handle. The long, stay cool handles are designed for a lifetime of use. All are highly polished including the Master-Chef 2 collection, which has a sand blasted look to match its brushed finish. The LTD collection has this sandblasted look only on the interior groove of the handle. Copper Core handles feature an forward stop underneath, comfortably formed into the same high quality stainless steel. All-Clad d5 LTD2: This collection is currently not available because All-Clad is in the process of introducing a new and more durable version. All-Clad LTD has a dark anodized aluminum exterior that will not chip, scratch, or peel. The anodized aluminum found in the All-Clad LTD collection is electrochemically treated to create a hard oxide finish and is dishwasher safe. In 2016, All-Clad introduced the commerical strong line All-Clad HA1 cookware. All-Clad Cop-R-Chef: This was All-Clad's first copper cookware line. It was replaced with All-Clad C2 Copper Cookware in 2014. All-Clad Copper Cookware: Most often complimented for its beauty, All-Clad C2 has a traditional copper exterior. If you like the warm look of copper, these superior pans will compliment any style kitchen. Copper polishing is your choice; some prefer the patina of unpolished copper. All-Clad Master Chef 2: With a brushed aluminum alloy exterior, All-Clad MC2 is often associated with commercial use. Two heavy layers of aluminum increase heating speed in this great value line. The handles are made of stainless steel. MC2 is made in the USA.